If you’re looking for a smart home security device, then you’ll certainly want to consider this one from Yi. Read our buying guide packed with information to help you decide if the Yi Security Camera is right for you. If you’re looking for an affordable home security solution, the Yi Home Camera may just fit the bill. It’s 1/4 the price of some of the more expensive options out there, but still has a ton of features that you’ll love, including motion detection alerts, 2-way audio, and card or cloud storage. The thing we love best about Yi is that multiple people can use multiple cameras under 1 account. This is a very convenient way for everyone in your family to be able to keep an eye on a pet, check who’s at the front door, or watch for a crying baby at night. You could also use this camera to keep an eye on an expensive toy like a boat or trailer that’s in a storage facility. As far as the quality goes, you get what you pay for. In this case, video quality is reasonable, but many people report that the 2-way audio doesn’t really work that well. However, for the price? Most people are happy enough with it. Many cameras come with a monthly or yearly subscription fee. You may not think it’s that much, but it can actually add up to a significant amount over time. The Yi camera—just pay for it once and use it forever. Love it? We sure do and love recommending products without hidden, recurring fees. Along with the camera, you can get 7 day storage of activity alerts in the Yi Cloud without a microSD memory card or a Yi subscription. Or, you can use your use microUSB card up to 32 GB for local storage. It’s a nice solution for someone looking for an affordable indoor security camera. Most people find that the setup process is super easy and takes just a few minutes. You can connect it up to the Internet by downloading the free smartphone app. For best results, be sure to read through the instruction manual. It’ll help you to avoid many of the troublesome parts of the process. The phone app is well-designed and we found the settings clear and easy to figure out. The design is simple and clean. Be sure to adjust the notifications to suit your security needs. Viewing security footage is really easy to do, and the 2-way audio works really well. It’s quite rare to get a pan and tilt enabled camera for something in this price range. The best news? It actually works. Besides that, the camera quality is great and the images and video are sharp and clear, even at night. All of this advanced technology comes in a small, affordable package! It’s one of the best choices in electronics. Why Consider Getting this Viewing Device? When you think surveillance camera, you probably think outdoor cameras that can keep an eye on things around your home. However, there are a number of reasons why you might consider an indoor camera. Here are just a few of them. If you have elderly parents who are staying in their homes, you’d probably appreciate being able to check in with them easily throughout the day. The 2-way audio allows you to do this. All your parent has to do is come sit in front of the camera and you’ll be notified that they’re there. Do your neighbours complain about your barking dog? Or, are you away from home all day and want to say hello to Fido? The Yi camera makes it easy to do this. If you have kids who are alone for a few hours after school, you may want to consider an indoor security camera like this one. It’s peace of mind for the kids, as well as you. The two way audio makes it easy for you to communicate with them when you’re at work. Finally, you may want to consider one of these products if you’re away from home a lot. Keep an eye on things around the house so you can worry less and enjoy your trip more! One of the features that we love about this camera is the baby crying detection. The advanced algorithms detect a crying baby within seconds. Then, you’ll get a notification to your Smartphone. Plus, the night vision feature lets you view your sleeping baby at night without any LED or infrared glare to distract them or wake them up. Very affordable, compared to some of the other smart home systems. The camera only records for a very short time-frame after motion is detected, and it’s difficult/impossible to change this feature, even with an SD card. The app has ads to up-sell additional storage options which some customers weren’t happy with. Some reports of difficultly connecting to the Wi-Fi network (on 5g). One of the main negatives to this device is that it does not have a backup battery option. If you lose power at your house, you’ll lose recording capabilities. Of course for the price, what can you really expect? Certainly not every single thing under the sun. When you consider it’s well under a hundred bucks, we were very happy with it. You can easily set it up within minutes, and it works well enough. Or, check out our reviews of two of the higher-end options for smart home Wi-Fi Cameras. For our money? We’d probably just spend a bit more to get a higher-quality camera with more features and customizable options. Our favourite of the two below is the SENS8. Two of the lower end options for indoor security cameras are this one from Yi, and the Wyze Smart Home Camera. Which one is right for you? We give the edge to the Wyze system. It’s usually a little bit cheaper, but just seems to work better. People like the video, as well as audio quality. There’s a 14-day, rolling cloud storage option that’s included for free. The package includes a mounting kit that allows you to put it anywhere without screws. The main negative to the Wyze camera is the motion detection system. Some of the negative reviews mention the camera picking up a fly, but not a person. If you’re looking for an affordable home security device to keep an eye on your baby at night, or talk to your pet while you’re at work, the Yi Home Camera may just suit your needs. It’s far cheaper than some of their competitors but it works well enough that most people are pretty happy with it. What you do miss out on are premium audio and video quality, but for the price, it’s good enough. We love that the motion detection feature works reasonably well, and also that you you have the option of cloud storage or SD card. Most people find that the Yi Security System is easy to get up and running, even with multiple cameras and multiple users. The software on the App in intuitive and user-friendly. 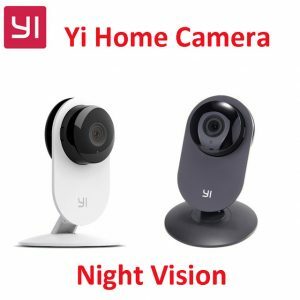 Yi Home Camera: Have your Say! What are your thoughts about the Yi Home Security System? Leave a comment below and let us know what you think.